Please consult the photograph above for details of the product’s design and retail presentation. According to Health Canada, the platform on the recalled Ladders does not lock securely in place posing a potential fall hazard for operators. If you believe you have purchased or have in your possession any of the recalled Step Ladders, please do not use them. Instead, kindly return the product to the store where you purchased it for a full refund. If you have any questions about this recall notification, please contact Home Hardware Stores at 1-519-664-2252 extension 6609, during normal business hours Eastern Standard Time, Monday to Friday. Alternatively, you can e-mail the company at contactus@homehardware.ca. 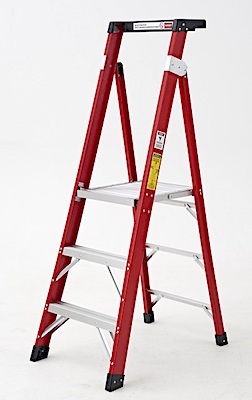 ==> To see other recalls and notifications caused by suspected faulty and/or dangerous Step Ladders, please search for “ladder” using the Search Box at the top of this page. ==> To see all recalls and notifications relating to Falls, please search for “fall” using the Search Box at the top of this page. ==> To see all recalls and notifications relating to Injury, please search for “injury” using the Search Box at the top of this page. ==> To see other recalls and notifications for products manufactured, marketed and/or sold by Home Hardware Stores Limited, please search for “Home Hardware” using the Search Box at the top of this page.